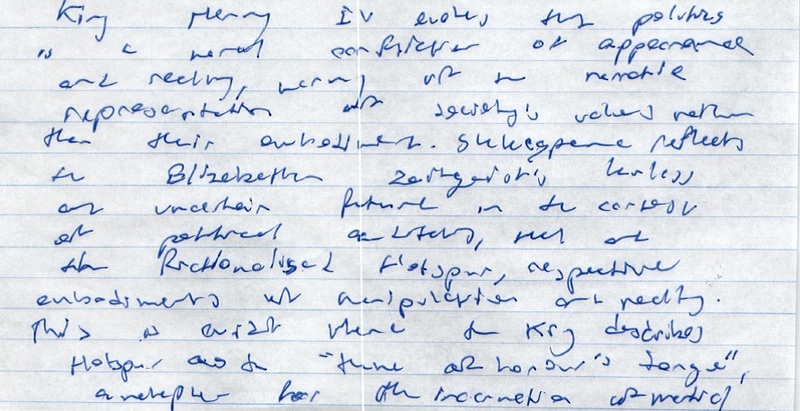 Come the end of Year 11, I often get calls from concerned parents of students who have been told by their school that their handwriting is illegible. These students have just written their first set of three hour exams, and have been called back to read aloud their exams to their teachers, or lost marks due to illegible handwriting, or lost marks through slow handwriting leading to incomplete responses. The loss of marks is not due to lack of preparation or knowledge: just simply poor handwriting and lack of practice in writing for extended periods of time. Working in a number of local schools, the feedback I have received from parents, students and teachers has increasingly been that poor handwriting is resulting in poor marks, despite hard work from the student. Not only are exam markers having difficulty understanding the students’ writing, the students are also having difficulty demonstrating their knowledge of the curriculum under timed conditions. Specific handwriting training employing the Cognitive Orientation for Daily Occupational Performance (CO-OP) is the only ‘green light’ evidence-based treatment for learning motor skills, such as handwriting. This method ensures an individualised focus on each student’s needs and goals which maximises their engagement with the work. It has been found to significantly improve writing legibility, speed, and task organisation. It also reduces fatigue under exam conditions, so that students’ start to overcome the problem of their hands “running out of puff” while they still have a lot more to write. The student and I jointly identify their specific goals. For example, it may be writing in larger letters, learning how to join letters legibly, increasing writing speed, and so forth. We develop a specific, focused, ‘deliberate practice’, plan to achieve their goals. The student does 10 minute sets of deliberate practice, 3 to 5 times during the week. I meet with the student once or twice a week, either individually or in a group, to review progress, and ‘fine tune’ their plan. We also devise ways of gradually incorporating legible handwriting into daily school activities. Does it work? Positive changes are often seen after three review sessions, although I usually recommend 10 sessions to make sure that the changes are “locked in” and likely to be robust under exam pressure. 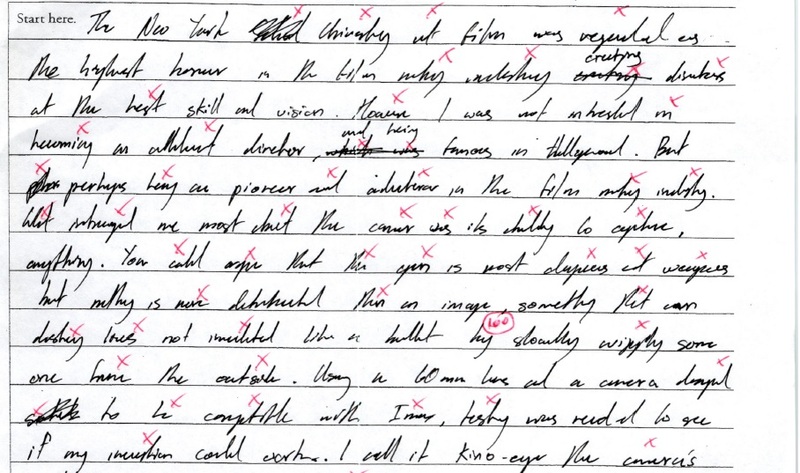 Student F was in the first term of Year 12 and a very conscientious student whose exam marks had suffered as his markers could not read his papers. This is Student F again after three individual sessions. So which paper would you rather mark? 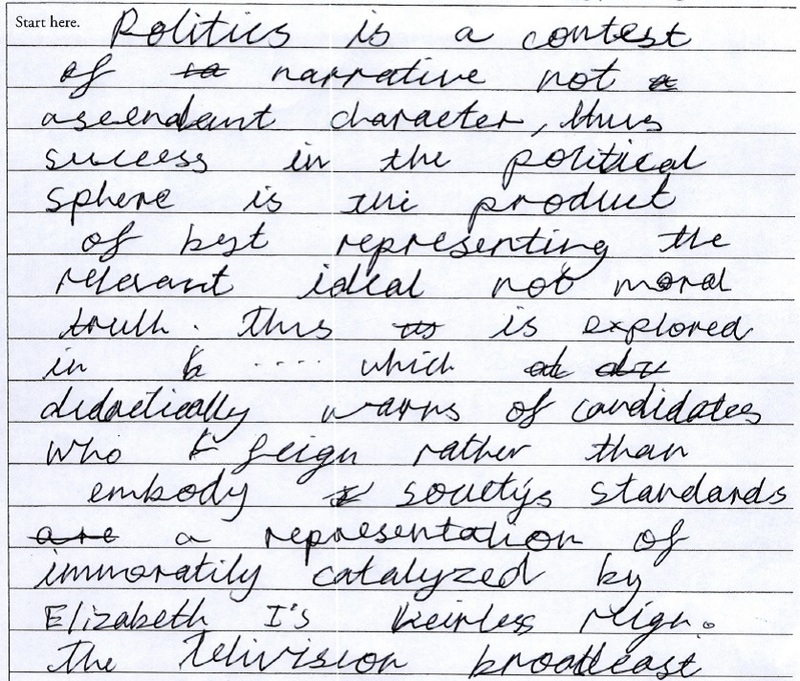 So, with Student F, not only did he improve the legibility of his handwriting, he improved the quality of his essays. Student D came to me four weeks before the commencement of his HSC exams. He was academically strong but hit a road block during the trials – the external markers could not read the work he produced during the three hour exams! His rather marginal handwriting was the “weakest link”, and fell apart almost completely under the pressure to get out all the knowledge in his head. Have a look at this paragraph. 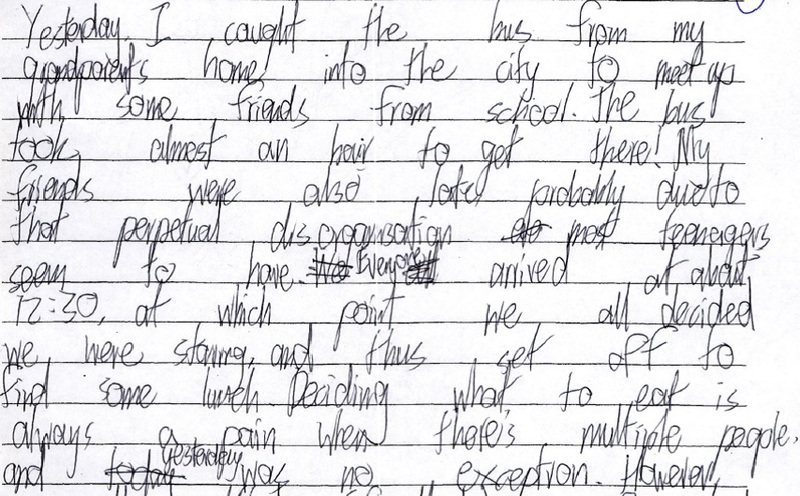 Imagine you are a busy HSC marker confronted with Student D’s handwriting for the first time. You don’t know what a great student he is, so – in all fairness – what would be the marker’s estimation of the knowledge represented in this paragraph? This is Student D after five individual sessions. Still not great, but it is now legible. It is markable! Student D said: “Thank you, it has been very helpful. It’s shown me how to write legibly and I can finish my exams legibly, and with time to edit my work.” He left our last session beaming. His HSC results were outstanding and commensurate with his abilities. Student L was identified very early as academically gifted. However, in term one of Year 11, his teachers were concerned that he was not able to complete his school exams due to hand cramping. He was a left hander, and while his handwriting has never been great, the cramping became a serious problem with the longer exams of senior high school. He spent an increasing proportion of the exam resting his hand, between furious burst of writing. Imagine a marathon runner who needed to pull over from a leg cramp every few kilometres. How anxious would he be, and what impact would the anxiety have on the athlete’s performance? This is Student L after three individual sessions. It is easier for the marker to read, but much more importantly, by working on his pen grip and his wrist movements, he learned to write for the first time without cramping. At the final session, Student L said: “My hand didn’t cramp up once, normally it would’ve cramped after half a page”. He left this session very confident about his exams in 6 weeks time. Now, I need to be clear: this is not a “magical” solution which I perform on passive students. These were all capable students, very motivated to remove a clear block to their exam performance. It doesn’t work if the motivation is located only in me, or the parents, or the teachers! 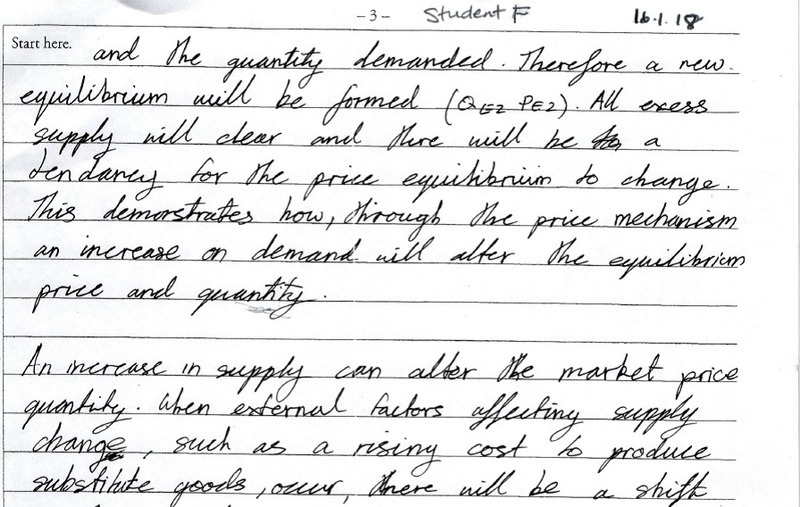 But, as you can see, with motivated students who want to work with me, and practice independently between sessions, it is definitely not too late to improve handwriting in Year 11 or Year 12.